Phantom ‘Whispered Muse’Rolls-Royce Phantom ‘Whispered Muse’ is a contemporary masterpiece that reinterprets Charles Sykes’ original drawings of the Spirit of Ecstasy. This remarkable Phantom demonstrates Rolls-Royce’s unrivalled leadership in the art of luxury. Whispered Muse’s design embraces Phantom’s unique glass ‘Gallery’, an area in which to exhibit unique works of art and design, by incorporating a sculpted silk adaptation of the Spirit of Ecstasy, created by British artist Helen Amy Murray. The feminine form of the ‘Graceful Little Goddess’ is echoed throughout the Bespoke treatment of the motor car. As a finishing touch, the Spirit of Ecstasy is crafted from Rose Gold – a first for Rolls-Royce Motor Cars’ Bespoke division. Commemorating the Czechoslovak Squadrons of the Royal Air ForceAn impressively creative twist on Dawn delivers an important narrative that pays homage to Czech and Slovak airmen who served in RAF squadrons No. 312 and No. 313 during the Battle of Britain. The livery of Spitfires used by these Czechoslovak Squadrons inspired the Dawn’s solid Grey exterior and Black coachline. Inside, the door flight on the driver side carries the motto of the 313th Squadron: “Jeden Jestráb Mnoho Vran Rozhání” (“One hawk chases away many crows”), while the passenger side commemorates the guiding principle of the 312th Squadron: “Non Multi Sed Multa” ("Not many, but much"). Intricate embroidery on the headrests depict the badges of the two squadrons and between the rear seats is an interpretation of the Rolls-Royce Merlin engine that powered these famous fighter planes. Inspired by original blueprints and engineering drawings, the detailed needlework enhances the technical and high-precision character of this significant motor car. Scarcer than Gold – the Ruthenium Phantom GalleryAnother outstanding example of Rolls-Royce’s pinnacle motor car is a highly Bespoke Phantom known as the ‘Gentleman’s Tourer’, which presents an aesthetic carefully tailored for trans-continental Grand Touring. The interior is a masculine, operational space, created for long, ultra-luxurious journeys. One feature in particular highlights the technical modernity of this motor car – the Gallery is fashioned from ruthenium, a precious metal from the platinum group. With only 20 tonnes mined annually – compared with 2,500 tonnes of gold – this is an especially precious addition to a contemporary Phantom. Silicon Valley meets Black BadgeGoogle’s Vice President of Engineering and a well-known car enthusiast, Benjamin Treynor Sloss, took delivery of a very personal Rolls-Royce Dawn Black Badge at 2018’s Pebble Beach Concours d’Élégance. The Bespoke Collective at Rolls-Royce reinterpreted the yellow-and-blue colour scheme favoured across the rest of his collection, inspired by the colours of the Modenese flag. A new, intense deep yellow named ‘Superflare’ is paired with the darkest of navy blues named ‘Pikes Peak Blue’ – due to Mr. Sloss’s interest in the king of timed hill climbs. The vivid colour scheme is continued throughout the interior, with the seats, dashboard, tonneau cover and rear seat ‘waterfall’ clad in Navy Blue leathers, highlighted with Bright Yellow seat piping and stitched Double-R headrest logos. Phantom in FuxiaA Bespoke Phantom was delivered in 2018 to renowned collector, Michael Fux, during Monterey Car Week. The Phantom was his eleventh Bespoke model from Rolls-Royce Motor Cars, following the ‘Dawn in Fuxia’ that was handed over during Pebble Beach 2017. As with a number of his other cars, the Phantom is finished in a truly unique paint colour, which is his alone to use – ‘Fux Intense Fuxia Pearl’. Carrying over some of his favourite hues from earlier cars, the interior is trimmed in a combination of vibrant purple ‘Fuxia’ and ‘Arctic White’ leather. This striking Phantom joins Mr Fux’s collection of more than 140 unique motor cars, which he uses to help raise funds for his charity – the Michael Fux Foundation – providing support to children and their families at the Miami Children’s Hospital. The Silver Ghost CollectionIn 2018 Rolls-Royce paid homage to the original Silver Ghost with the creation of 35 Bespoke examples – the ‘Silver Ghost Collection’. These motor cars boast carefully-considered references to the past: a solid sterling-silver Spirit of Ecstasy, a hammered-copper insert that pays tribute to the material in the original’s engine bay, and the newly created hallmark ‘AX201’, a tribute to the famous registration plate. Further references to the model’s heritage include open-pore Tudor Oak veneer with silver inlays throughout the cabin and a Bespoke coachline that incorporates 100% pure silver particles. Adamas – the darker side of contemporary craftsmanshipRolls-Royce unveiled Adamas in 2018, its first ever Black Badge Collection, comprising 40 Wraiths and 30 Dawns. The character of these motor cars is reflected by the Adamas name, meaning ‘untameable’ or ‘invincible’, with the resilience of a diamond. These Wraiths and Dawns showcase a darker side of contemporary craftsmanship, with unbreakable carbon structures woven into the motor cars to create a beguiling beauty that captures the rebellious spirit of Black Badge. For the first time, the Spirit of Ecstasy is formed from machined aerospace-grade carbon fibre, while the dashboard clock is encrusted with laboratory-grown black diamonds. 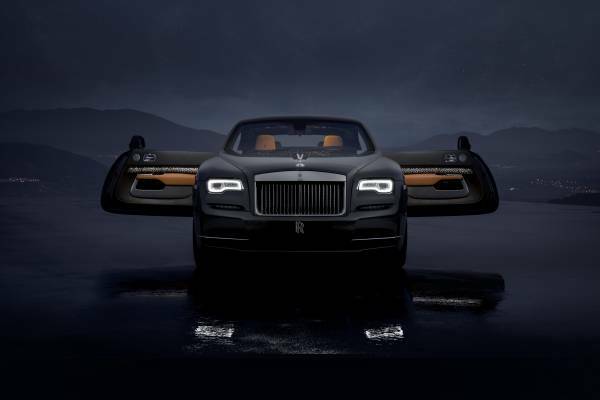 Wraith Luminary CollectionThis ‘highly charged’ series of just 55 Wraiths presented a world first for Bespoke craftsmanship. On opening the coach doors, the owner is met by a truly innovative statement of modern luxury, with intricately perforated Tudor Oak wood veneers admitting light from an array of 176 LEDs. The wood is sourced from the forests of the Czech Republic, selected for its depth of colour and the density of the grain structure. Dawn Aero Cowling2018 saw the transformation of Dawn. A Bespoke, lightweight ‘Aero Cowling’ tonneau cover is fixed in position over the rear seat area, creating a roadster-style motor car that can still be converted to a full four-seater when desired. Crafted from ultra-lightweight carbon fibre and aluminium, the Aero Cowling is sculpted to funnel airflow for enhanced comfort, and can be matched to your personal specification of Dawn. Cullinan Viewing SuiteThe Rolls-Royce Viewing Suite is automatically deployed at the touch of a button. Two rear-facing, beautifully contemporary, fine leather chairs and a cocktail table gracefully emerge from within the rear compartment – creating a luxurious viewing platform from which to take in the surroundings; whether that be a sporting engagement or some of the world’s most breath-taking vistas. The launch of this feature previewed the near-limitless opportunities for enhancing Cullinan with highly Bespoke modules to suit all manner of lifestyle requirements.